The Fisher-Price Soothe & Glow Owl lights up and glows, with hoot-hoot sounds and over 15 minutes of soothing music - just give it a gentle squeeze. His bright orange feet are also perfect for little ones to chew on during periods of teething. 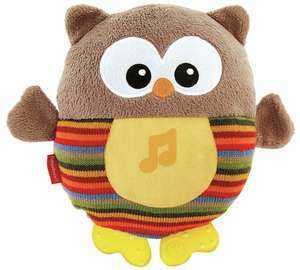 Plays charming hoot-hoot sounds & over 15 minutes of soothing music. Soft, cuddly and soothing with a calming, glowing belly. Baby activates sounds with a gentle squeeze, introducing cause & effect. Soft knits and plush fabrics with pink accents.